Speranza Maria was born of an "unknown union"
It's hard to imagine how difficult life was for our ancestors hundreds of years ago. Mine lived in rural Southern Italy where there was no industry or luxury. Each town had a barber, a shoemaker, a shopkeeper. But most people were simple farmers. Hundreds of people died each year—even in these small towns. Families struggled to survive. With their life-and-death struggles in mind, it's easier to understand how people remarried within months of their spouse's death. That was a hard thing for me to imagine at first. But as I documented more and more people from one such town, I saw the same pattern over and over. I found dozens of people who had married more than twice. Let's take a look at Speranza Maria Esposito. 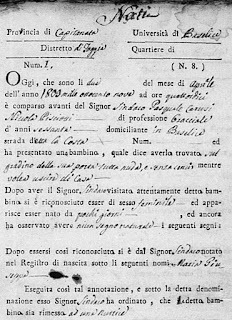 Speranza was born in 1803 to genitori ignoti—parents unknown. The midwife delivered the baby and reported it to the mayor. They named her with the traditional last name for such babies: Esposito. Loosely translated it means without a spouse. At age 21, Speranza married Mario Nicola Basile and had four children all of whom died in infancy. Their 14-year marriage must have been hard on them, burying four babies. Mario died before his 40th birthday. As a young widow and with no family, what could Speranza do? This was not the time or place for independent women. Less than two years after her husband Mario's death, Speranza married Pasquale Ferro. Pasquale was a 40-year-old recent widower with one surviving child, aged 10. Together they had one baby girl, Mariarosa, who also died in infancy. Three years later, Pasquale died, leaving behind a 14-year-old daughter from his previous marriage. Speranza went another four years before marrying Filippo Colucci. He was a 43-year-old recent widower with a nearly-grown daughter and a teenage son. They married in May 1848. Speranza died in October 1848, childless. She'd married three times, widowed twice, and given birth five times. Do you know what the name Speranza means? It means Hope. I'm sure Speranza hoped for a better life than the one she got. Her last husband, Filippo, also married a third time, less than two years after Speranza died. He and his third wife Annamaria Pisciotti had three children. This was also Annamaria's third marriage. The children survived. Speranza married three times. Each time she must have hoped for a better life. It was a hard life. A man needed a woman and a woman needed a man to survive. To care for one another as best they could. Seeing so many cases of multiple marriages helped me understand my grandfather's final days in New York City. When my grandmother died in 1954 my grandfather was 52 and in good health. He had a long life ahead of him. He lived with my parents for a few years, but months before I was born, he married a spinster. Sadie was 56 years old and childless. When she died in 1986, Grandpa still had decent health and needed a woman to care for him. He chose to stay in his neighborhood and spend his time with a widow who cooked for him and made him happy. In Grandpa's case, he had choices. He chose not to live with his daughter, who had opened up her home to him. He chose not to marry a third time. But a man still needed a woman, and a woman still needed a man to survive. Be sure to consider the time and place when you make unexpected discoveries about your ancestors. 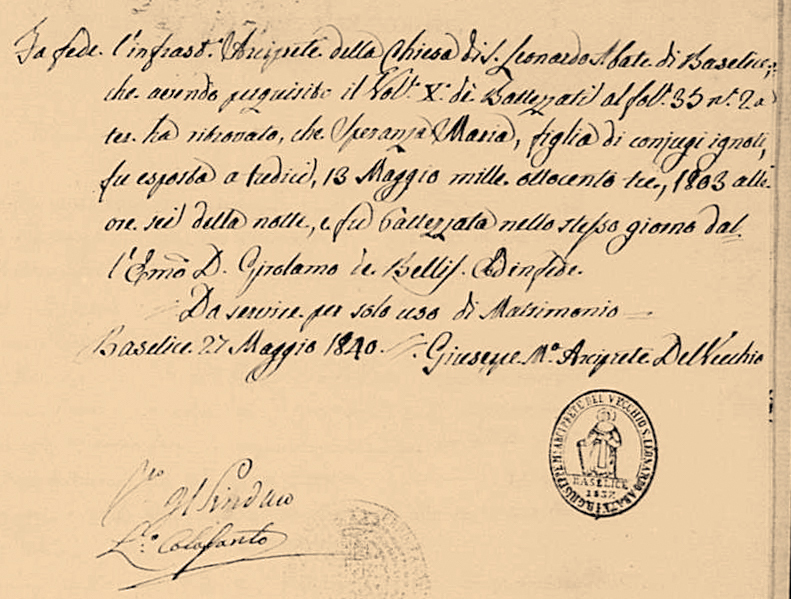 1809 birth record for foundling Maria Giuseppa. I had the wrong image here before! 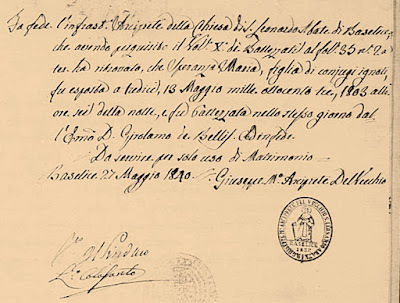 When I began researching Italian birth records from the 1800s, I noticed something curious. These babies were often listed separately from the other births and labelled projetti. I asked my friend to explain this to me. He is an expert in Italian genealogy who comes from one of my ancestral towns. He told me the projetti were babies abandoned at birth. The father's identity was unknown, and the mother's identity was known only to the midwife. What's an Unwed 1800s Mother To Do? Try to imagine a young woman in Roman Catholic Italy in the 1800s who finds herself pregnant and unmarried. Maybe the man refuses to marry her. Maybe he refuses to acknowledge that he is the father of the baby. What does this young woman do to avoid bringing dishonor to herself and her family? Angelamaria Biferno is named after a river in the area. First she would have to hide her pregnancy, possibly leaving town for made-up reasons. Then she could deliver her baby with the help of a midwife who would keep her identity a secret. The midwife (levatrice in Italian) would report the birth to the mayor without naming the baby's mother or father. If you are the descendant of an abandoned infant, you may find the birth record in the town where the baby was raised. The baby might have been raised in a foundling home, a foster home, or a monastery. This was a system that saved the pregnant woman from shame and gave the baby a chance at life. There was a way for a mother to reclaim her abandoned infant. At the time of birth, she could leave with the baby some item that only she could identify. It might be something as simple as a piece of cloth or a blanket. She could later claim the baby by describing the item and the date of birth. This rarely happened. This can lead to confusion for family tree researchers because the baby kept this name for life. A man named Esposito, abandoned at birth, would pass the name Esposito on to his children, and his sons would pass it on to their children. Don't assume that your Esposito ancestor was an abandoned baby. In my grandfather's hometown of Baselice, Italy, they preferred to name abandoned babies after rivers and towns. They did not give them a name that marked them for life as abandoned. Now let me throw a monkey wrench into your family tree research. Sometimes the abandoned baby was not born out of wedlock. It is known that in Milan and Florence ... the majority of abandoned children were legitimate. We can guess: poverty, deformity, severe illness. Imagine how heartbreaking that must have been for the woman giving birth. The images in this article include two examples of projetti from the rural town of Baselice. I found a handful of projetti recorded each year from 1809 through 1860. The first image does not give the foundling a last name. 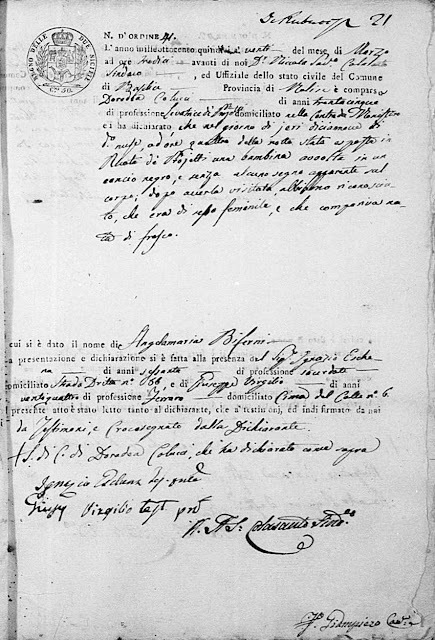 Since the document explains how my fifth great grandfather, Nicola Pisciotti, found the baby, I thought he and his wife had raised her. The document says my ancestor, age 60, found the baby girl outside his door. She had no identifying item that the mother could use to reclaim her baby. The mayor names the baby Maria Giuseppa and turns her over to a nurse. So the baby girl is probably raised in a foundling home or in the monastery along with many other projetti. 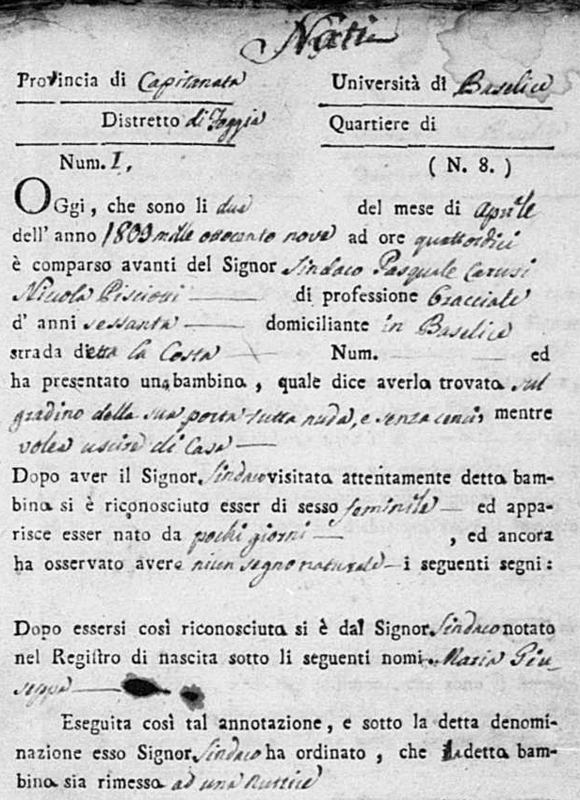 The second image is the birth record of Angelamaria Biferno in 1815. Biferno is not a last name found in the town of Baselice, but it is the name of a nearby river. Dorodea Colucci was the midwife who delivered Angelamaria and most of the babies in this town. She goes to the mayor and presents the baby, wrapped in a black rag, but without any other sign from its mother. Angelamaria Biferno grew up in the same town and married there. Unfortunately she died at age 28 and had no children. Angelamaria Biferno is a big puzzle for me. 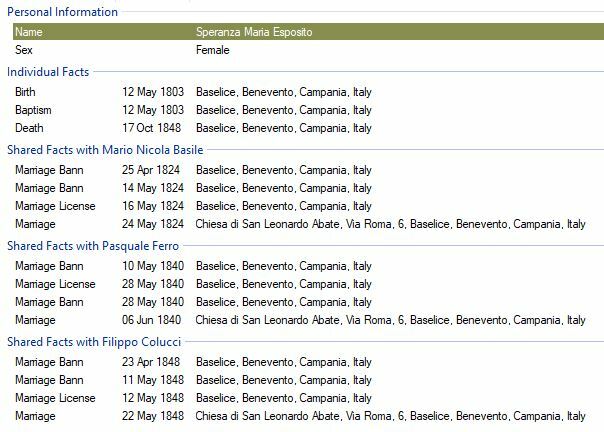 Marriage records from 1843 include another Angelamaria Biferno, born about the same time, and in the same town. She was also an abandoned baby. She married a man in Baselice the same year the first Angelamaria Biferno died. They had at least six children together. The confusing, overlapping case of the two Angelamaria Biferno's needs detailed examination. Let's save that for another day. To learn more about the Italian Infant Abandonment system, see the FamilySearch Research Wiki. Can Genealogy Research Be Painful? What's Napoleon Got To Do With Italy?